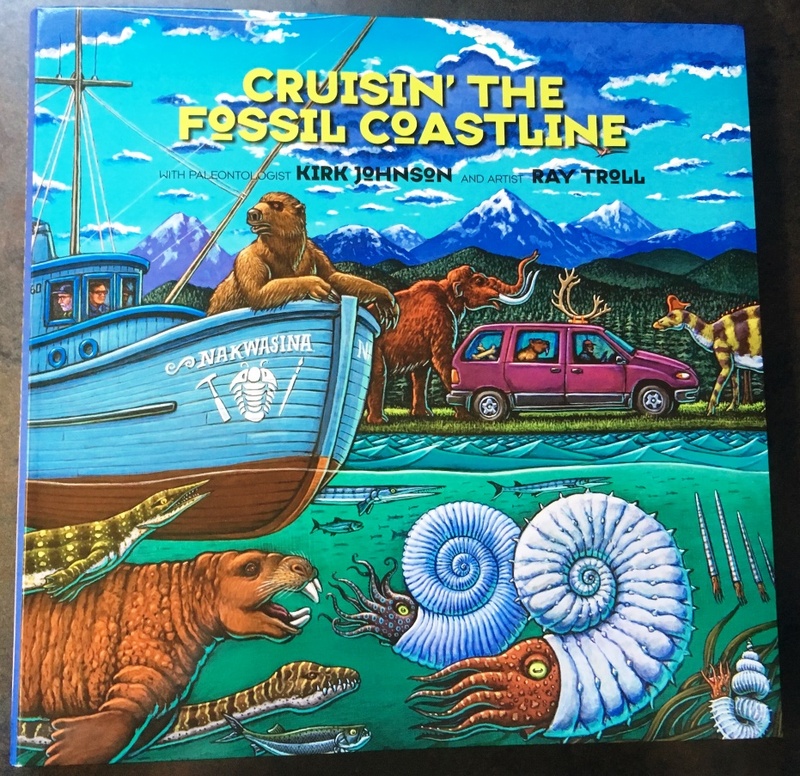 Ray Troll and paleo-botanist Kirk Johnson’s first book, called “Cruisin’ the Fossil Freeway,” came out around 2009. That’s a long distance, with literally tons of fossils along the way, so it makes sense the book took 10 years to complete. While the book is a seamless tour up the coast, the actual journey was broken into a series of trips. The result is about three pounds worth of book. What’s in there is a whole bunch of new, original, full-color artwork by Troll, illustrating Johnson’s vivid descriptions of life along the West Coast billions (with a B!) of years ago. 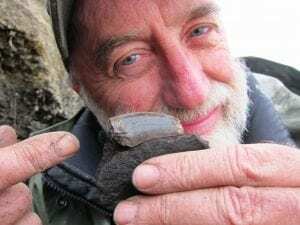 I spoke to Johnson by phone from Washington, D.C., where he is the director of the Smithsonian Institution’s National Museum of Natural History. Like a good paleontologist, his tale of the new book goes all the way back to the beginning. Johnson later saw some of Troll’s fossil imagery, and decided it was time he traveled to Ketchikan to meet the artist. That was 1996, and the meeting spawned a close friendship and 20-plus years of collaboration linking science and art. “So we, both being West Coast people, thought what a cool idea to travel the West Coast from top to bottom,” he said. Or, bottom to top. Depending on how you look at it. 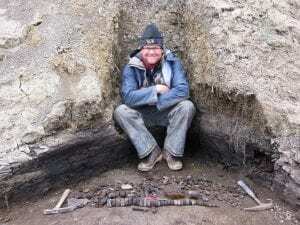 They started in Southern California, with a visit to the La Brea Tar Pits, and headed north. Troll said the research was funded through a Guggenheim fellowship, which covered all the travel. That’s WAY up north. And that’s where Troll fulfilled a childhood dream that he’s held onto long into adulthood. A photo in the book shows a close-up of Troll holding that special tooth, with tears of joy in his eyes. “I was 58 years old at the time, but still, you can see the beating heart of a 5-year-old within me there,” he said. 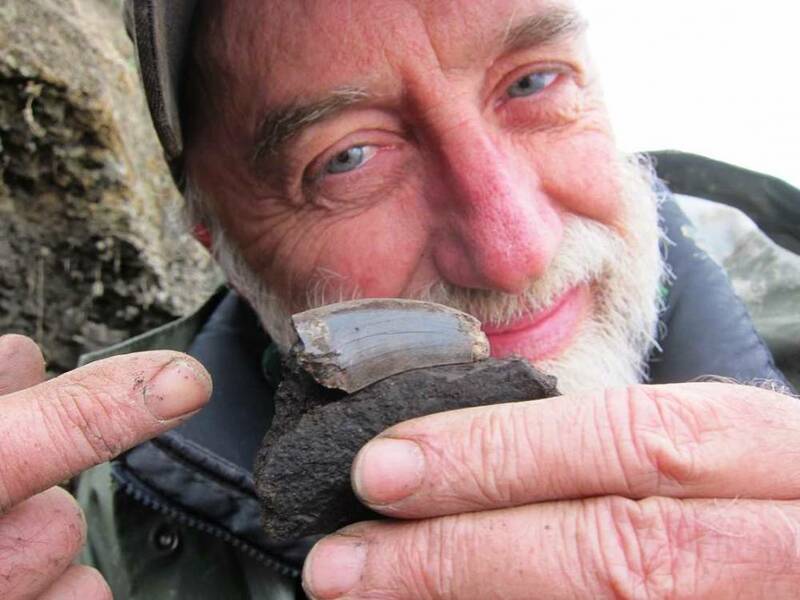 You don’t have to go that far north to find fossils in Alaska, though. Johnson said a parallel moment for him was on a beach near Sitka. A film crew was there, getting footage for a Nova special called The Making of North America. Johnson said he was trying to find a fossil leaf on camera, and it just wasn’t working out. Troll made his name as a fish artist, but said his first and lasting love always has been dinosaurs. He hopes to share that through this new book, along with a little knowledge about the planet we all call home. And for Johnson? What does he hope people take away from the book? Now that this book is done, is another one stewing? Johnson said maybe in about a year, he’ll decide it’s time for another “Troll Project.” After all, there’s no shortage of natural history for the two friends to explore. Troll will be giving a power-point presentation and signing copies of the new book Sunday, Sept. 16th. The event starts at 3 p.m. at the Ketchikan Public Library.